OH-MA-GAWD! Don’t you just want to climb into the bowl and bathe in it? 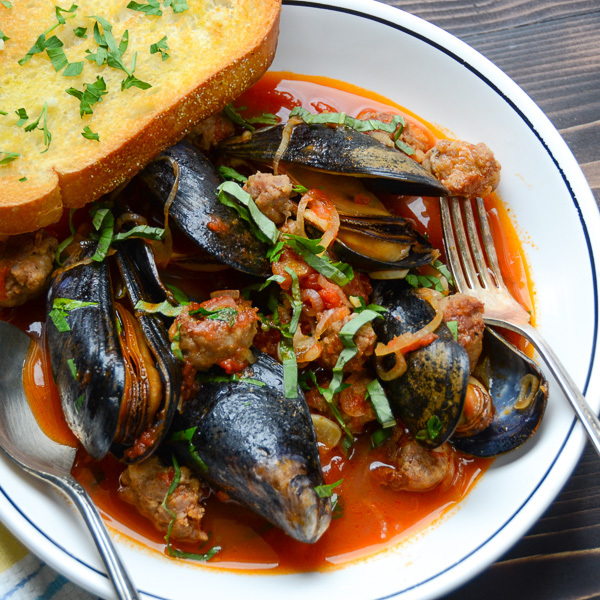 Fresh steamed mussels, spicy italian sausage in a wine-infused tomato broth. I don’t know if there’s anything better! Best of all, this dish is a one-pot wonder that comes together in minutes. Really! I cook and shoot most of my posts during the day, because the “light” is better. Consequently, lunch around here tends to be “top notch” And when Emily and Scott are around, they are more than happy to pitch in to “bounce” the light or adjust a prop because they know what’s coming. That was the case with these mussels. Emily was home and as my anointed assistant for the day, she helped me remove the casings from the sausages and break them into bite sized chunks. We browned them and added plenty of thinly sliced garlic and shallots. Some crushed tomatoes and white wine made a savory broth. And then came the mussels. I scrubbed them, removed the beards and toss out a few that refused to close when I handled them, but that was ok — better safe than sorry, right? I added the mussels to the simmering pot and literally 5 minutes later — TA-DAAAA!!! Lunch! Actually, it was about 15 minutes later when we finally settled in to this steaming pot — I had to take a few pictures for you! Dive into this pot of mussels and garlic with gusto -- it's the only way to attack this dish! Heat olive oil over medium high heat in a dutch oven. While it's heating, break apart the italian sausage into bite size pieces. Add them to the hot oil and cook for 4-5 minutes until browned and cooked through. Add the shallots and garlic and cook an additional 1-2 minutes until softened. Stir in the crushed tomatoes, red pepper flakes and white wine and heat to boiling. Cook for 3-5 minutes until most of the alcohol has cooked off. Add the mussels to the pot and gently stir them into the tomato sauce. Cover tightly with the lid and reduce heat to medium. Cook for 4-5 minutes until the mussels open up. Remove from heat and sprinkle on the basil and parsley. Serve with crusty bread or toasted garlic bread to sop up the juices, or serve over cooked spaghetti. Wow- that looks amazing! I never would’ve thought to combine these flavors but it sounds delicious! It’s also gorgeous! Thank you! It’s simple to make and really good! OMG any leftovers? I’m sure these are amazing!